Honda is famous for their 4-cylinder VTEC and i-VTEC engines, but they also have V6 engines in their stables. The Acura NSX had a 3.2 litre V6 and the current shark-faced top of the range CBU Honda Accord on our markets has a 3.0 litre SOHC VTEC V6 engine with the code J30A under the hood. However, USDM and Japanese versions of our Accord (actually called the Honda Inspire in Japan) has a new i-VTEC version of the J30A. 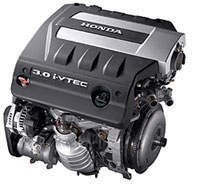 What’s special about this new J30A with i-VTEC is it comes with Honda’s Variable Cylinder Management technology. What happens is under low engine load the i-VTEC system disables 1 of the two cylinder banks, effectively turning the engine into a 1.5 litre inline-3 instead of a 3.0 litre v6. What Honda defines as low engine load is actually a mixture of vehicle speed, engine speed and throttle position patterns. The disabled rear cylinder bank is sealed by idling the intake and exhaust valves and no fuel is injected. Now everyone knows 3-cylinder straight engines have alot of vibrations due to the cylinder count being unbalanced. What happens is vibration is cancelled out by the active engine mounting. This engine mounting rocks in a similiar motion to dampen the vibrations. Noise is also cancelled out with a special speaker which emits the exact opposite phase of the engine noise read from a microphone. Pretty funky stuff. What you get is a 3.0 V6 with the fuel economy of a 2.4 litre inline 4 cylinder under normal mixed city and highway driving situations. This is approximately 11.6km per litre, compared to the Accord 2.4 running the K24A which manages 12km per litre. Getting down to the basic performance stats, the J30A makes 250 horsepower and 296Nm of torque.